The same Siesta Key property owner who has proposed a new multi-story structure on the beach near Access 10 has begun a new application process with Sarasota County. This time, he is seeking to replace an existing single-family residence at 636 Beach Road with a six-unit, multifamily dwelling over a garage that would be 185 feet seaward of the Gulf Beach Setback Line. The Gulf Beach Setback Line (GBSL) is what county Environmental Permitting staff refers to as the “line in the sand” designed to preserve native beach habitat, including dunes and grasses, and thus protect property on the landward side of the line. The new structure at 636 Beach Road has been designed with a footprint of 5,736 square feet, the application says. Its habitable area seaward of the GBSL would be double that of the existing structure, the document notes. The design includes a pool and deck, which would comprise 1,893 square feet, as well as a drive (3,417 square feet) and walkways (1,533 square feet). The total footprint at ground level would be 6,956 square feet, according to the application. 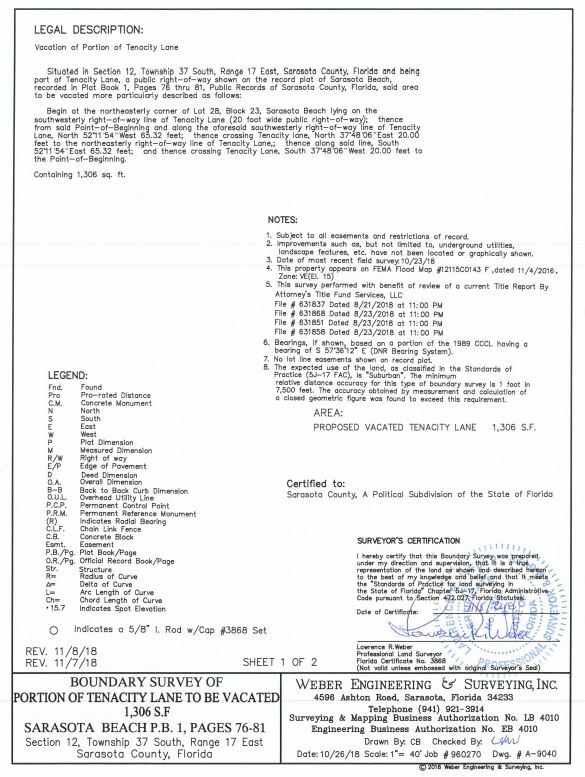 The owner of the 636 Beach Road property is Saba Sands LLC, whose manager is Sarasota attorney William A. Saba. As with his proposal for the new structure near Beach Access 10, Saba has engaged Sarasota attorney Robert Lincoln as his agent in the application process. Lincoln submitted the application to county staff on April 30, 2018, county records show. The proposed building and associated structures would be at least 617 feet from the Mean High Water Line, the narrative adds, and approximately 400 feet from the vegetation line. Nonetheless, a Sarasota County Charter amendment that 72% of voters approved on Nov. 6, 2018 forbids the County Commission from vacating any road segments that have even a “waterfront vista.” The county has joined a complaint in the 12th Judicial Circuit Court, arguing that the constitutionality of that amendment — proposed by Siesta resident Mike Cosentino — is in question because of its conflicts with the authority state law accords to county governments. County Media Relations Officer Drew Winchester reported in early January that no date has been set for the County Commission to hold a public hearing on the Coastal Setback Variance Saba is seeking so he can construct the new dwelling units. Additionally, SNL asked whether county regulations are more flexible regarding Coastal Setback Variance petitions involving replacement of existing structures that stand seaward of the GBSL. 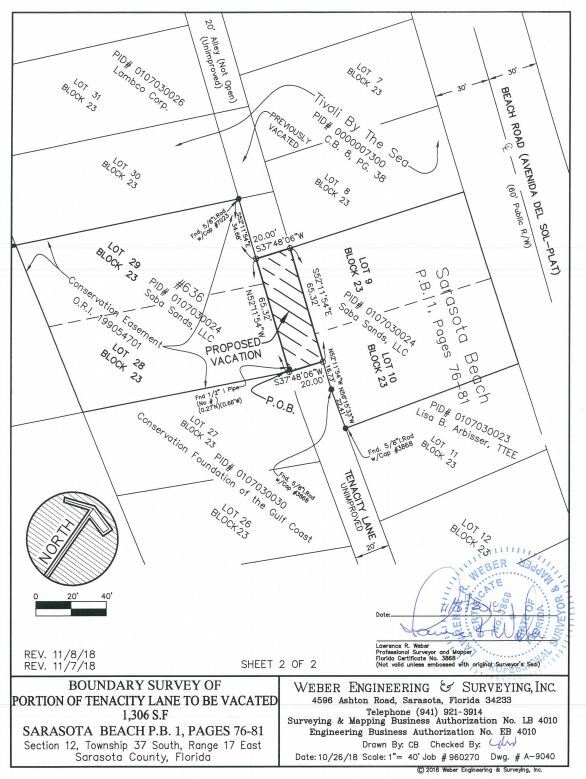 The narrative accompanying the application for the 636 Beach Road project says the parcel consists of four platted lots zoned Residential Multi-Family 1 in the Siesta Key Overlay zoning district. That designation allows 6 units per acre, the narrative points out. However, the narrative points out, Saba is proposing to build only six units.